Bellford Home in cup Tea Infuser with Tea Spoon is a fast and simple way to steep loose leaf tea! Steep, Strain and Infuse - Make your favorite loose leaf tea in minutes. Simply scoop the tea in your infuser with the stainless steel spoon, set the tea infuser in your mug and pour hot water into the infuser. Put the lid on to keep the heat in, wait 2-3 minutes and drink up. Extra-Fine Mesh - Advanced Filtration - Say good-bye to debris in your tea! The 304 stainless steel mesh is extra fine, meaning the tea leaves stay out of your drink. No extra filters or tea bags are needed. Built to Last - High Quality Made from rust resistant 304 stainless steel, this is the only tea filter you will need. Designed For Usability - A lid comes with your purchase to keep the tea hot while brewing. Flip the lid over and use it as a tray when the tea filter is pulled out of the mug to keep you counter clean. The arm of the infuser will sit on the rim of your cup, making it easy to remove. Easy to Clean - Wash with warm water and soap. Infuse Fruit, Spices, Herbs & More - The extra fine mesh allows for infusing coffee, fruit and spices. Make sure the material being steeped is larger than the mesh filter. When brewing coffee, make sure the grounds are course and pour the water in slowly. A paper filter is recommended to keep the finer coffee grounds out. Sizing - Fits cups and mugs between 2.25" to 4.25" wide and at least 2.5" deep. EXTRA FINE MESH - Enjoy the full flavor of your loose leaf teas without the debris. The fine mesh will keep the tea leaves out of your drink. Great for brewing your favorite fine loose leaf tea. UNIVERSAL USE - Fits most cups and mugs with openings between 2.25 - 4 inches and that are at least 2.5 inches tall. 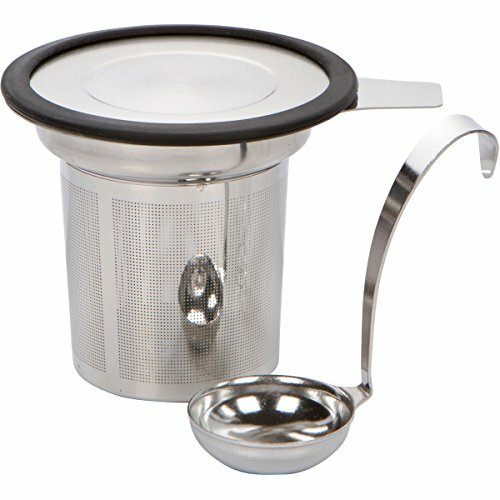 SILICONE & STAINLESS STEEL LID DOUBLES AS COASTER - The lid keeps your tea hot while steeping and doubles as a coaster for the infuser to keep your counter clean. The lid fits snug, on top of the infuser. ENJOY your perfect cup of tea. Order Now! If you have any questions about this product by Bellford Home, contact us by completing and submitting the form below. If you are looking for a specif part number, please include it with your message.